A new play written by a Vermont theater veteran takes a comedic look at life, death, and family relations. Pronouncing Glenn tells the story of Millie, a caregiver for Glenn, a woman in her late 70’s. Glenn’s daughter is home to help care for ailing mother, but the relationship has gone sour. Meanwhile, caregiver Millie is the only person who knows that Glenn has actually passed away. With the best of intentions, she keeps this a secret, hoping to heal the rift between mother and daughter. 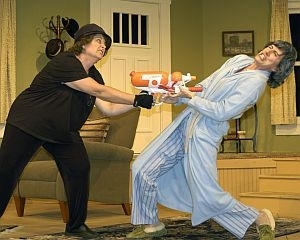 In this scene, caregiver Millie confronts nosy neighbor Dorcus, who has read about the benefits of washing the elderly with a super-soaker. (Glenn-supersoaker) "So what her ears were clogged…I told you no yesterday, she was dead. (Gasp) Oh you knew. You knew yesterday she was dead and you didn’t tell anyone….no wonder you didn’t want us to use the super soaker on her. That’s not the only reason, it’s because it’t the stupidest thing I have ever heard. I am going home now and I’m taking my supersoaker with me. Oh you give me that, I can’t believe you used that on Glenn. I didn’t get a chance to…you killed her first. Oh you know that’s not true. I was just trying to help, this is the thanks I get? Thanks for what…hosing the infirm? I have experience with sick people. That’s because you are one!" (Charnoff) "Pronouncing Glenn" was written by Carole Vasta Folley of Shelburne. Folley is also directing the production, and plays the role of Millie the caregiver. She took the idea and decided it would work best as a comedy. Folley says it’s important to note that Millie’s actions are driven by compassion, love and loyalty to the family. (Carole) It’s about family. It’s about connections we find with each other. And I hope the major subtext is that when we lose somebody, they’re still with us. (Charnoff) Folley feels that some themes revolving around loss can be better served by comedy than by drama. (Carol) I’ve had a lot of loss in my family lately, and one thing I have found is that laughter has helped us get through that. So I hope people can appreciate the zany crazy irreverent thing and at the same time know that we care. We care. Even about the character in our play who passes away, it matters. (Charnoff) Liz Huehn of South Burlington is co-producing Pronouncing Glenn, and is a longtime friend of Carole-Vasta Folley. Huehn says Folley’s play has captured themes any audience member can relate to. (Huehn) "Both Carole and I have lost our mothers. We both had different experiences around that, and there is a story about loss in the midst of all this comedy. It was so cathartic to get the funny out of that part of my history, and it was wonderful to finally find the humor in what is always a difficult time in your life." "You are not leaving until you tell me what you know about Glenn. (Gasp) Oh you know. You know. Oh no, I don’t know. I don’t know about Glenn. Oh and I thought it couldn’t get any worse. Worse? It got worse? Well how did you find out? How did you find out? Well, when I wrapped the garbage bags around…Garbage bags? It is getting worse…much much much worse. But I didn’t shoot the supersoaker. Supersoaker? You know, I know too much already Dorcus, I don’t want to know anymore. I’m already an aider and abetter." (Charnoff) Carole Vasta-Folley has directed and acted in many Vermont productions, but this is the first time she’s shared her own writing. (Carole) "I’ve learned that it’s a more vulnerable process than I thought. I feel more exposed. These are my words. These are my characters. This is what makes me laugh. I think it’s the closest think I can think of to having a child. You have a kid, and then you have to send them out the way it is, and just let them go. I think I’m going to walk away from this with many lessons I don’t even know yet." Folley says her primary goal is to entertain the audience. Pronouncing Glenn runs at the Town Hall Theater in Stowe through October 11th.